1)Nationality: Be a Nigerian citizen by birth and possess National Identity Number (NIN). 2)Age: Must not be less than 18 years of age or more than 25 years of age. 3)Education: Must have an O’ Level Certificate at least Five (5) Credits level passes including Mathematics and English Language in not more than two sittings in WASSCE/GCE/NECO/NABTEB. 4)Character: Must be of good character and must not have been convicted of any criminal offence. 5)Height: Must not be less than 1.67 metres in height for men and 1.64 metres for women. 6)Chest Measurement: Must not have less than 86cm (34 inches) expanded chest measurement (for men only). Speech Impediment, Knock Knees, Bow Legs, Bent Knees, Flat Feet, Deformed Hands which cannot perform the full functions of the hand, Tattoos, Bodily Scar, Defective Eyesight or Squint Eyes, Amputation of any part of the body, Gross Malformation of teeth, Protruding Navel. 8)Pregnancy: Must not be pregnant at the time of Recruitment. 9)Financial Status: Must be free from any pecuniary embarrassment. Traditional Rulers, Magistrate, Local Government Chairman, Heads of Educational Institutions attended, Career Civil Servant not below the rank of Grade Level 12, Police Officer not below the rank of CSP, or Military Officer not below the rank of Lieutenant Colonel. Possession of a valid National Drivers’ License is an added advantage. 4)Ensure that you print out the information that is sent automatically to your Email, and do not forget to copy and save your REGISTRATION NUMBER for future correspondences. The NUMBER is case sensitive please. 5)You would be required to present a hardcopy of email message sent to you if you are shortlisted and contacted for the next stage of the recruitment process. i.No email and/or phone number can be used more than once in this application. 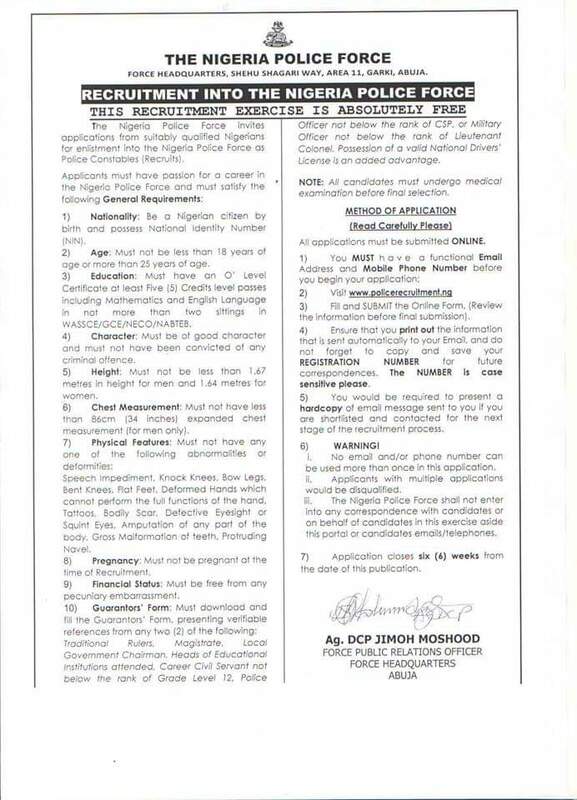 iii.The Nigeria Police Force shall not enter into any correspondence with candidates or on behalf of candidates in this exercise aside this portal or candidates emails/telephones. 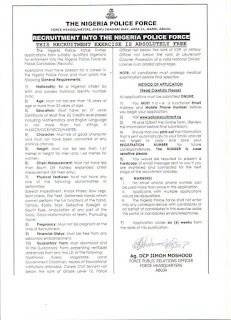 7) Application closes six (6) weeks from the date of this publication.